The new Crescent Moon Eva V2 Snowshoe was designed for every snowy winter outing from your backdoor, whether in the city or the mountains, blurring the line between traditional snowshoes and running shoes. Boulder, CO (October 29, 2018) – The new Crescent Moon Eva V2 Snowshoe was designed for every snowy winter outing from your backdoor, whether in the city or the mountains, blurring the line between traditional snowshoes and running shoes. With the Eva V1 widely recognized and awarded at Outdoor Retailer, V2 enhances the capabilities with a set of six rubber “tri-star points” in the Keyflex traction plate, to bring added durability. 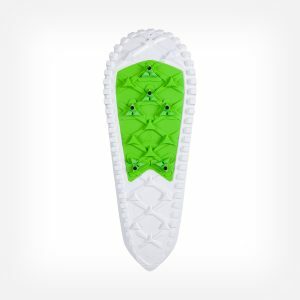 Each tri-star point is equipped with ICESPIKE™ steel traction, for improved ice grip. Additionally, the V2 utilizes an improved binding system with reinforced rubber hook and loop fasteners, for both the over-foot straps and heel strap. The love child of a snow tire and running shoe, the Eva V2 is patent pending by the makers of the world’s best snowshoes since 1997. Media kit can be found here. For media inquiries, please contact Adrian Goad at adrian@boldbrewteam.com. For retail inquiries, contact Jake Thamm at jake@crescentmoonsnowshoes.com. Since 1997, Crescent Moon has been making snowshoes for outdoor enthusiasts who value gear performance, quality and reliability. Regarded for its innovative, easy to use bindings and unique frame shapes, as well as being the first to design snowshoes specifically for women, Crescent Moon continues to set the standard for snowshoe design with new materials and technologies to create the world’s most dependable snowshoes. The company manufactures its aluminum framed shoes in Boulder, Colorado, using sustainable materials and business practices. Please visit crescentmoonsnowshoes.com to view the product collection and learn more.